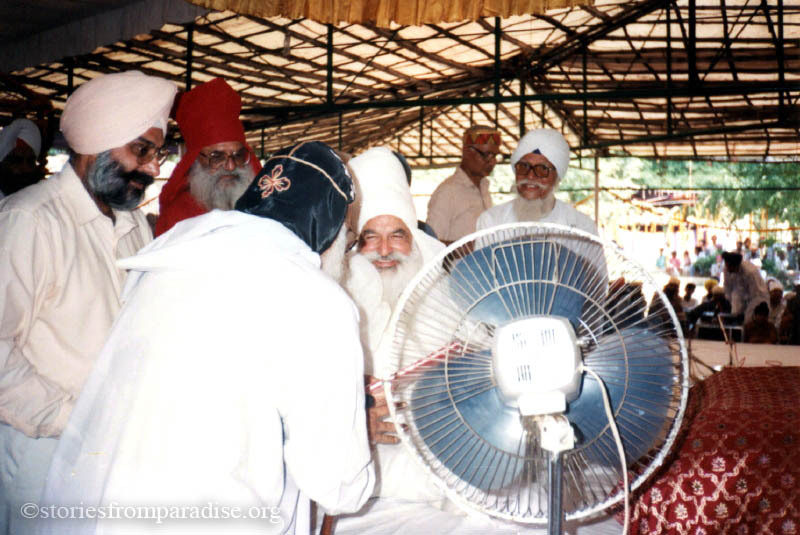 Like Baba Siri Chand, our Maharaj ji is highly respected by people of all religions. 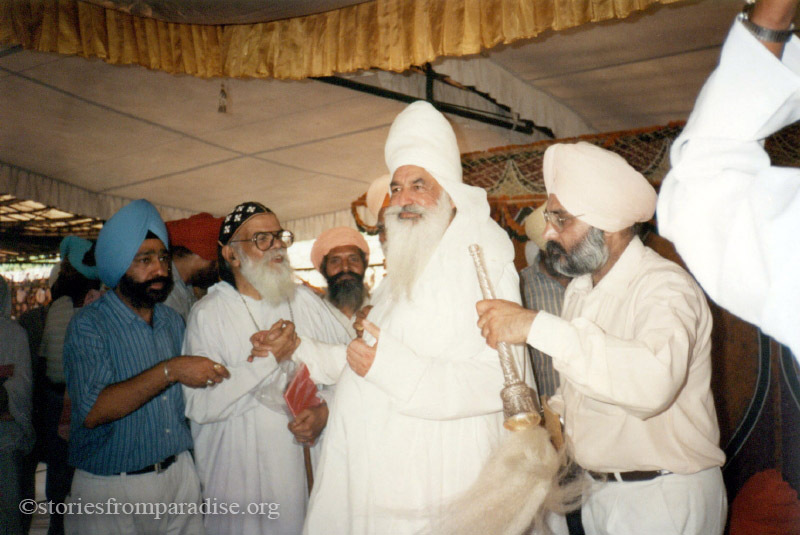 At his invitation, many spiritual leaders have come to honour Baba Siri Chand’s birthday. Yesterday one of our most special guests made a surprise appearance. 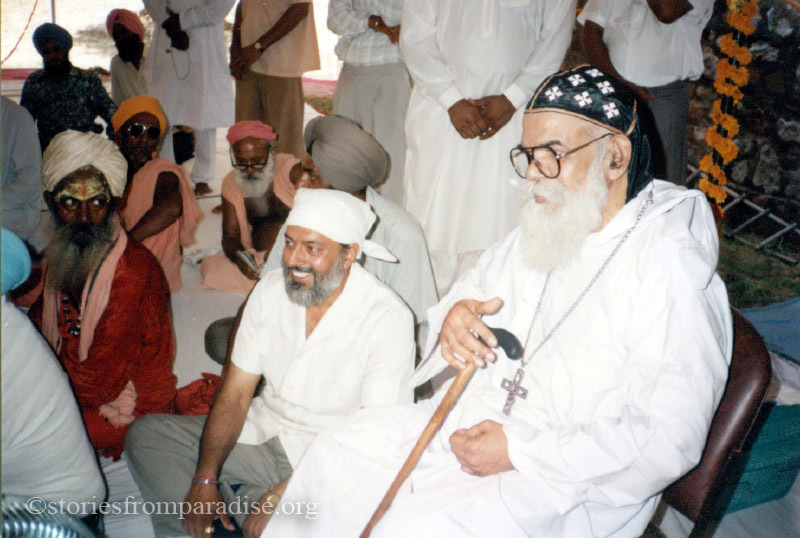 Thin and weakened by a serious stroke, Father Paulos Mar Gregorios, Past President of the World Council of Churches (the world’s largest Christian organization), bravely made his way up to the stage and was warmly embraced with great love by Maharaj. 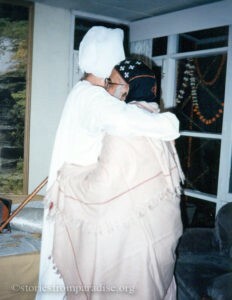 At the end of the function, he went to Maharaj and took Maharaj’s hand and placed it firmly on his bowed head. He stayed in that position for several minutes, soaking up as much of the blessing as possible. 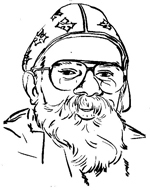 Father Paulos Mar Gregorios is one of the pre-eminent Christian leaders in the world. He is Past-President of the World Council of Churches and Metropolitan of the Syrian Orthodox Church. He is also a brilliant scholar of all religions. And he considers Baba Virsa Singh his Guru. Often he comes to Maharaj Ji for spiritual guidance. 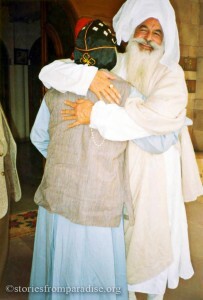 Father Gregorios is so impressed that a Sikh teacher loves Jesus that he has asked Maharaj Ji to attend a meeting of the Orthodox Christian leaders of India so that he can introduce Maharaj Ji to them. To our great amazement, Maharaj has agreed, out of his profound love for Father Gregorios. We are amazed because Maharaj rarely speaks at outside meetings. But he does not want to hurt his friend, and thus he has agreed. Time passes. Maharaj Ji does not arrive. Father Gregorios periodically makes worried visits to the parking lot, asking us how soon Maharaj Ji will arrive. We ourselves do not know. 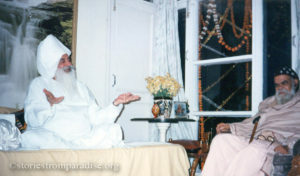 At last there is some telephone conversation in which Maharaj Ji tells Giani Ji to speak on his behalf. Maharaj himself does not come. 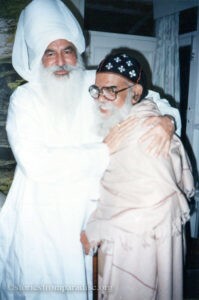 Father Gregorios is terribly dismayed, for it is always his desire to display his Guru Maharaj to the world. Last night Maharaj said that he wanted to pay Father Gregorios a visit of love today, so it was arranged. Maharaj said he had a very strong inner feeling to do so for the past few days. This is highly unusual, for Maharaj has not left Gobind Sadan since August, not even to attend the special programme Father Gregorios had arranged on December 30 to introduce him to Orthodox leaders. Maharaj says, “The message of God has spread only through the love of such people. When big meetings were held, love was less. What were the meetings of Jesus? As he walked along, he healed the animals, the trees. You cannot confine Jesus in one sect. His is not this earthly light—it is the Light in all Creation. If we see truly, this is not the fault of the public. If Jesus sits in judgement, he will forgive them all. But He will be annoyed with the priests. He will ask them, ‘What have you done with My message?’ Our soul must first meet Jesus inside in order to understand Him. Whatever has come from the prophet’s mouth is God’s message. What comes from our mind is not from God. That causes conflicts. I have full faith that the whole world will change, when He wants. No tree, no sea is outside of His Order. The day that He passes the Order, everything will change. Jesus was never angry, except in the Temple of Jerusalem,when he saw what the priests were doing. We must understand what He said: ‘Thieves are in my Father’s House.’ Jesus said you can never use love. They were trading love. God chooses whom He will, but people see only the priests, and they are supposed to see God through them. We must speak strongly on some big platforms. If priests retreat, the conflicts will end and the people can really worship God. There is no high or low, rich or poor. Everything is standing on love. He forgives people’s sins. Why could priests say they forgive sins? They never tolerated them. Just see through Jesus how forgiving God is. If His son is so forgiving, imagine His Father. That is why I love you so much—because you are away from what the others are doing. I don’t like all the seminars, the talks from books. Jesus is in our hearts. Why can’t we speak from our heart? Otherwise, He is not speaking—we are speaking. When He speaks, the whole world will change. He will soon speak. There is so much power in His voice that the whole world will unite—except those who are giving wrong messages. We must question people why they are saying what Jesus never spoke. I think you also feel the same. I am waiting for that day. Jesus was standing behind the dairy in a flowing open robe with long open sleeves. His hair reached to his shoulders, and he had a small natural untrimmed beard. He was a thin, tall figure, more than six feet tall—perhaps six and a half feet—with thin wrists and a thin nose. His voice was very strong, echoing throughout the cosmos. But despite its power, it was also very calm. After he spoke, you could still hear the echoes. He was speaking in several languages. He was standing in a dung-filled place behind the dairy—there was no cleanliness there. The importance of this place is that Jesus Himself stood there and spoke there. An ocean of healings will happen there at Jesus’ Place. Crores of people will come. I am averse to fame—but if they go there for healing, it has nothing to do with me. I don’t go to these big functions. Dharma is not a matter of books, speeches, or seminars. Wherever Jesus went, he healed the trees, the animals, the earth under his feet. I feel that Jesus is not Christian. He is Light, in which there are no boundaries. Father Gregorios, in his love, always wants to take me to these meetings. Jesus is love, compassion, service. It’s your choice to identify with any religion, but Jesus gives Light to all Creation. We can say that if our faith is great. People think that Jesus has gone, but He is here, speaking with me. When I go to the United States, many things happen: allergies, skin problems, heart murmur, hand shaking, digestive problems, breast lumps, pinched nerves, bursitis, etc. I have to drink bottled water there. I used to think it was a matter of jet lag, but if that were so, I would also suffer on coming back to India. Instead, these problems all vanish when I return here and I become stronger and healthier the longer I stay near Maharaj. The last time I went—to greet my grandson Caleb, the new incarnation of Maharaj’s close sevadar Hervinder Singh—Maharaj had initially said, “Why are you worrying? There are plenty of people over there to take good care of the baby, and you know you get sick whenever you go there.” I didn’t want to take this guidance, so later I took his permission to go a few days after the baby was born. What happened? Not only did my daughter’s family not need me—they hardly even wanted me there for I was dreadfully sick with allergic sneezing, and they were afraid I might have the pneumonic plague which had just broken out in India. They even checked with their doctor to see if I could come near the baby. I spent my time outside miserably allergic, in a tent, and hardly held the baby at all. Not only could I not help—I was a burden on them. Maharaj knew. When I called Father Gregorios on the phone today, he said that he was so very weak and exhausted these days that he could not even get out of bed. He asked for Maharaj to pray for him. Later today, we were given the message that Father Gregorios was sending a bishop to see Maharaj. To our great surprise, it turned out that the bishop was Father Gregorios himself. Reaching Gobind Sadan, he struggled to get out of his car and into his wheelchair. Maharaj was sitting in the lawn but kept offering to go into the house if that would suit Father better. He spoke to him of how happy God is when a person keeps loving Him even in the face of great difficulties. Then Father Gregorios wheeled himself in his wheelchair over to Jesus’ Place, with Shami pushing. He told Maharaj that he wanted to sit there praying for about ten minutes. After Father Gregorios had sat there in intense silent prayer for some time, Neelu (daughter of Geeta Singh) appeared with a glass of water sent by Maharaj, with instructions for me to place it in the rocks at the base of the cross and pray for Father Gregorios and then give him the water to drink. As I did, the power coming through from Maharaj/Jesus was so strong that my body was shaking. After Father was wheeled to the house, where Maharaj had tea with him, he said that for the past five days he had very strong inner guidance to go see Maharaj and pray at Jesus’ Place. What he experienced there, he said, was both great peace and great power. He wants to come back again and again and to tell the world about Maharaj and Jesus’ Place. Maharaj says he will become healthier and healthier. I requested Maharaj to bless a copy of Loving God for Father. To do so, Maharaj got up and stepped to Father’s side. With his left hand he blessed the book, which Father was receiving with two hands, and with his right hand on Father’s bowed head he blessed him for a long time. Father then said he felt much better already—and indeed, there was a rosy glow in his face as he left that certainly had not been there before. After this incredibly touching encounter, Maharaj spoke to us about Jesus and Mary, who was so blessed by God to be a vehicle for the Light. 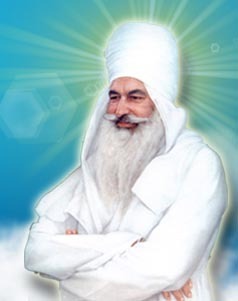 He said, “The prophet’s light is always passed on to someone,” such as Peter and Guru Gobind Singh’s Five Beloveds. I learned by phone that you have gone abroad. We have prayed that your physical difficulty will be healed. Your words and your love are so necessary for the world. God will make you strong. Come to Gobind Sadan, and also meet people. They so need God’s Kingdom of which Jesus spoke. I send you my love and God’s healing. When you read this letter, you will feel this love and this healing very strongly. The energy in the world is not good for health, but I have absolute faith in God that He will bless your health. You are such a person who has given his whole life to speaking of the love of God. Quickly become well, come back, call us, and meet us. There is a very hidden secret in this. Just as a worldly father is so concerned for his children, as Jesus once said, “Those people are blessed who love and praise my Father in both happy and difficult times.” What we speak of as worldly difficulties are also matters of blessing. By your faith, God will make you well. Special love and concern is being given by God to such as you. In your inner love, there is no need for letters. Love is an inner feeling of which we cannot speak. We cannot say what it is. I am sending my message of love and my inner feeling to you, that God may bless you. Just so, Jesus was a healer of people, of trees, animals, earth—of all places. With that love, you will be continually healed. I’ve just returned from a busy 10-day visit to Russia on Maharaj’s behalf. He had seen in vision since childhood that Russians would be the most faithful followers, even though Russia was at that time officially atheistic, and this prophecy is coming true. Speak only about what you have seen and heard at Gobind Sadan, and nothing else, for this will have a great effect. For your whole life, only speak from your own experiences at Gobind Sadan. Even if everyone is against you, don’t be frightened. People will be wonderstruck with happiness—‘What is she saying?’—like when Jesus spoke. And the newsletters will break the forts [boundaries between religions and people]. After five months, these things will have more effect. The blessings from heaven and the voice from the earth will unite. There will be no chance of clouds’ coming before the sun. People will be looking for you, for you have led them out of the waves to the Boatman. Many people will have dreams and visions of you, and those hidden people who are reciting Nam will have visions of Gobind Sadan. After two and a half years, there will be a great impression on the minds of the whole world. Then this circle will continue: Many people will have visions and will come here. A flood of people will come, and many people will do parchar (preaching about the mission). Many people from Russia will join you. Speak a lot—it will have quite an effect. I am no speaker; I have no good memory from which to make a speech. As Maharaj said, I can only speak about my own experience. But what I have witnessed at Gobind Sadan is so powerful and so transformational that I happily speak about it to anyone who will listen. 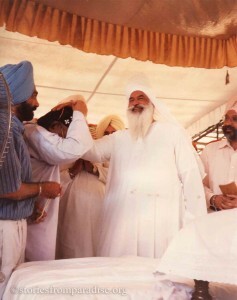 I also met with an assortment of people such as Stephan Pozenian, whose video team accompanied Maharaj in 1989 when he visited Moscow with Swaranjit Singh, Ludmila Kokhlova, a Punjabi Professor from Moscow State University who is translating Jaap Sahib into Russian for Gobind Sadan, space scientists with interest in spirituality, and members of the Unification Movement living in Moscow who are translating my textbook Living Religions into Russian. One afternoon, many dear Russian sisters and I sqeezed cozily together on the benches around a round table in the home of Ludmila Eliseeva, a spiritual painter who deeply loves Maharaj Ji. As we drank tea and ate home-made foods they had brought to share, we talked about Gobind Sadan and spiritual subjects that are close to all our hearts. They took me to special sacred places, of which my favourite was the sixteenth-century Kolomenskoye Church of the Ascension. An unseen choir was softly singing Orthodox hymns in beautiful polyphony, and those uplifting sounds wafted upward through the extraordinary spiral architecture. All the arts in Russia have deep spiritual wellsprings, and seventy years of official atheism could not quash those sentiments. Russia has been dear to my heart since my childhood, so I am very grateful that Maharaj’s mission is closely aligned with Russian spirituality. May our Russian sisters and brothers keep coming to Gobind Sadan and carrying Maharaj’s message throughout their homeland. Father Paulos Mar Gregorios, Syrian Orthodox Metropolitan and former head of the World Council of Churches, is Maharaj’s dear friend. Now he has a serious ailment which limits his activities and may threaten his life. He has come to Maharaj for intimate encouragement. Some people take on other people’s sufferings by praying for them. Somebody touched Jesus’s garment. That healing passed to her immediately. He [felt that and] asked, “Who is touching my dress?” People who heal always have to take a little of others’ sufferings, as if carrying them on their shoulders. To understand this is dharma. In love there are no questions. You surrender to Him, and He does. All power comes from Jesus. You will be all right because you are doing work for the Great Worker. He knows what is happening to you. A child doesn’t know, but the father always takes care of him. Whatever He does is right. Whenever we think correctly, it is only because of Him. If the priests will move aside, God will come in as a flood. What can they do without Him? They should move aside and let Him work. But they will only move aside when He chooses. The more we interfere in His work, the more problems we create for ourselves. Let Him do, and enjoy. We are only His guests. He has given us everything free. If we even thank Him from all the pores in our body, even then we cannot thank enough. To understand that He is beyond us is the ultimate truth. But yet He is also within us. If He leaves, we are dead. My feeling is that if people become clean, all Creation will be purified. Our poisonous thoughts pollute the atmosphere. That poison disturbs everything. We should think: Is the Messiah wrong or are we? He said to love and serve. We should decide whether He is right or we are right. We say that Jesus is great. He is, but not by our saying so. The time has come that dharma will spread. The bad people who are misusing the Name of God will be exposed. In those conferences about religion, there is no love—just “How can I become famous?” Never bow your head to such a person. Only praise your Father. He is already the most famous. The flowers and trees are praying to Him. Government leaders always think of themselves, but the main problem has been created by the religious leaders. Always look at what dharma says; try to please God only, not the government or the people. Stay away from wanting to be famous. If we stay only with God, then God, the public, and we will be happy. If we bring ourselves in, none of us will be happy. Clean yourself; let His Light of Love enter you. His Light is coming 24 hours a day, but we have closed all the doors. Only a little of that Light passes through those doors. A person who makes forts will never be happy. Everything is bowing to Him, but we are always interfering. He minds, but He doesn’t scold us because He is full of love. He watches us, laughing. Who has stopped that flow of love from Him? The priests. People get discouraged with me, for I don’t go to their meetings. But what can I do? I don’t have any inner permission to go. You may consider this my fault—or maybe it’s God’s gift. Everywhere they were going to use my name—not for God, but for their personal reasons. People are ready to believe, but the person who is speaking is giving wrong guidance. You don’t even have to speak. Vibrations heal.